Signs By Van is the ultimate custom sign designer in California. You will find our beautiful signs displayed proudly on storefronts, restaurants, wineries, commercial businesses, and more. One avenue that we are excited to work in is the wedding industry. 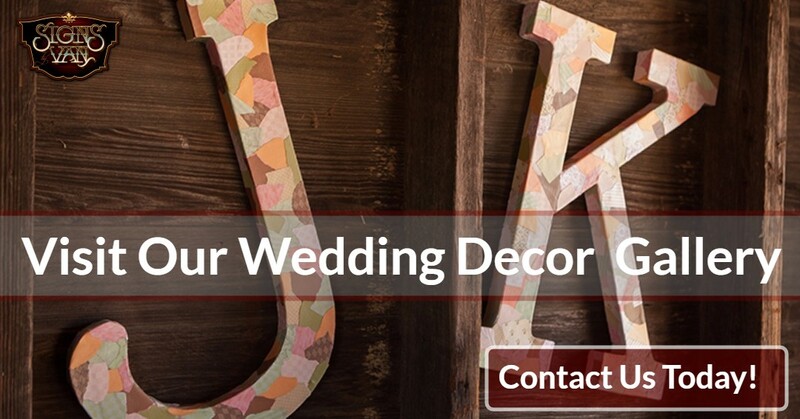 Custom signs have multiple purposes—they are useful to direct wedding guests throughout your ceremony site and beautiful as your personal touch and wedding theme can speak through the signage. Custom wedding signage can be used in every aspect of the wedding and Signs By Van has been fortunate to be apart of the many weddings in California. If you’re planning a wedding and have found yourself overwhelmed with the overwhelming amount of details, then this blog may interest you. Here, we’re going to mention a few popular wedding signs that other brides have used to create direction and display their own personal touch. You might be surprised how many custom signs can be used throughout the ceremony and reception, so we’ll break down the order of events to help inspire you. The last thing you want for your guests upon their arrival is confusion. Depending on the location of your wedding venue and the parking situation, the possibility of Grandma getting lost on her way to the ceremony is very real. Luckily that can be completely avoided by placing a few signs to direct everyone to the appropriate location. Once guests have arrived at the ceremony, guests are greeted by a guestbook. If you have attended a wedding within the last ten years, you might have noticed that an actual book that guest sign is a thing of the past. 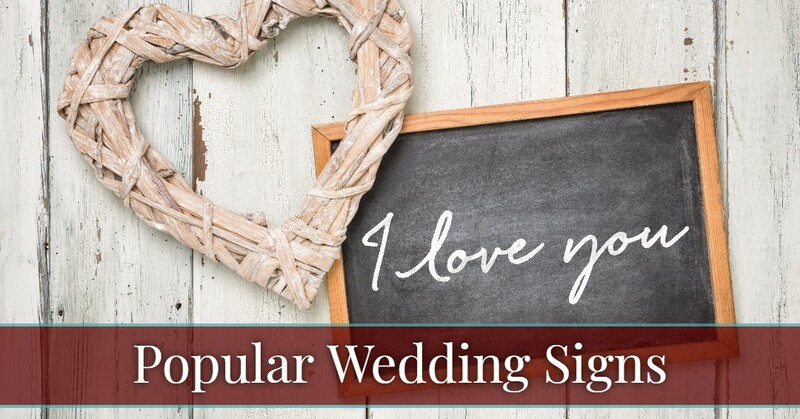 Instead, couples are choosing creative ways for their friends and family to sign a picture, wooden initials, or monogram that can be displayed at home. One of the most popular wedding signs is to explain an open seating plan. The tradition of the bride’s family sitting on the bride’s side, and the groom’s family sitting on the groom’s side, is far outdated. Signs By Van can create an elegant sign that will direct your guests to find a comfortable seat, wherever they choose. All the fun happens here. The reception is the best part of the wedding celebration—there is dinner, drinks, dancing, cake, and plenty of custom signage opportunities. Just like at the ceremony, your guests might need some help finding the right place to sit. A common dispute brides and wedding coordinators find themselves stewing over is a pre-planned seating arrangement. By creating assigned tables, your guests find their seats much faster, and the faster people sit, the faster dinner is served, and the faster the party can begin. In order to execute this in a well-organized manner, it’s easiest to create table numbers and associate that with a name card. Signs By Van can create unique table numbers that will fit in perfectly with your decor and can work into your centerpiece decor. Another wedding tradition that is slowly fading away is to serve wedding cake. Dessert is usually still served, however, it just comes in smaller servings, like cupcakes or cookies. Many wedding guests find themselves too full to eat a plate of cake right after a large tasty meal. Instead, brides have started to design a sign that can rest on the dessert table to instruct guests to help themselves throughout the reception. If you are planning to serve a buffet-style dinner, signs can be placed to label the type of food and ingredients. A custom sign can also be used at the bar to list drink prices, welcome gratuities, or a creative drink menu. Custom wedding signs are truly limitless and are intended to be fun and creative. The professional sign makers at Signs By Van will take every small detail into consideration to make sure your wedding is absolutely perfect. And every sign that we have discussed on this blog is something our experts would gladly create for you. Click here to submit your online contact form. We look forward to working with you to create something beautiful.